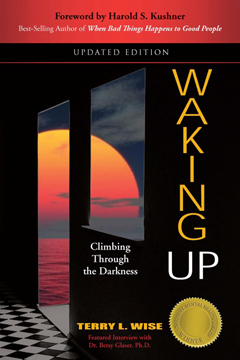 I first “discovered” Terry Wise after reading her book, Waking Up. It was somewhat by accident that I even found her book. I was looking for something that I could use with my patients. Not only did I find a book that could potentially change the lives of my patients, I found a book that helped me see how very important the responsive relationship between the therapist and the patient really is. Terry’s book reminded me how important it is to be caring and compassionate during the therapeutic process. In her book, she describes that those struggling with depression and suicidal thoughts, even though it appears impossible, can find a reason to live. I was fortunate enough to meet Terry this year. She agreed to be the keynote speaker for the American Psychiatric Nurse’s Association-Nebraska Chapter’s fall conference in Omaha, Nebraska. The conference topic was suicide and self-harm, and Terry was phenomenal with her approach to these two topics. She offered very valuable information, and ultimately, a personal story of hope and the wonders and importance of life. She is captivating and is truly personable with those that she interacts with. It was an extreme honor to work with Terry, and I can only hope to work with her again in the future. It is also my recommendation that all practitioners, “young and old,” read her book about courage and recovery.